Alan Mulally is president and CEO of Ford Motor Co. and a member of the Board of Directors. 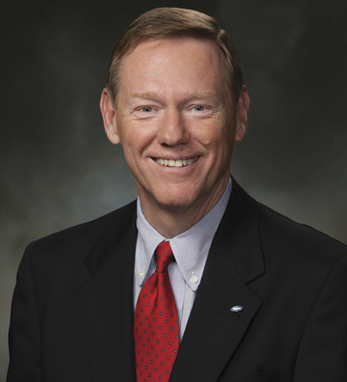 Before joining Ford in 2006, Alan was executive vice president of The Boeing Company, and president and CEO of Boeing Commercial Airplanes. Throughout his career, Alan has been recognized for his industry leadership, including being named one of The World’s Most Influential People by TIME, one of The 30 Most Respected CEOs by Barrons, Person of the Year by Aviation Week and a Best Leader by BusinessWeek. Alan serves on President Obama’s Export Council. He is a member of the U.S. National Academy of Engineering and a fellow of England’s Royal Academy of Engineering. A Kansas native, Alan holds BS and MS degrees in aeronautical and astronautical engineering from the University of Kansas, and earned a master’s in management from MIT as a 1982 Alfred P. Sloan fellow. With a surname derived from the Gaelic Ó Maolalaidh, Alan traces his roots to the western counties of Ireland, and to Galway in particular.